Gina Fensterer is a busy mother of 6 kids, a pretty amazing graphic artist and a fabulous human. I have followed her instagram for the past few years and am always amazed at what her creative brain comes up with. I have also dropped a dime or two purchasing prints from her fabulous easy shop other side of the fence. Her shop is filled with beautiful prints, quotes from the saints and stunning photography. I am also blessed to call her one of my Blessed is She sister’s, as we both write for that ministry. Recently, she reached out and floated a new design idea she had. 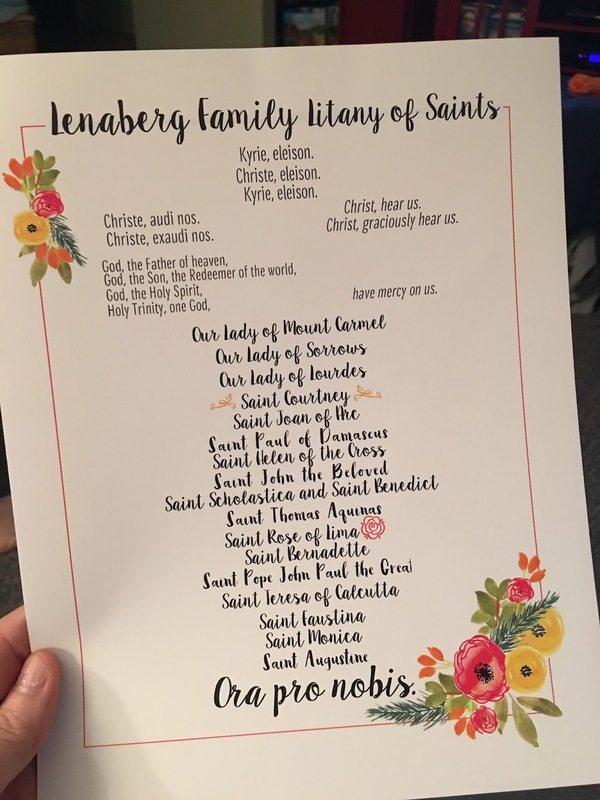 Creating a family “Litany of Saints”. How cool is that? She asked for a list of the saints our family asks to intercede for us and she would take it from there. I happily handed over our favorites and waited (rather impatiently) to see what she would create. When I opened the package, I cried. It’s a perfect rendition of our families litany. Gina chose colors that have meaning to me. Courtney’s colors. She even included our sweet girl in the litany. So very sweet. I love it. I absolutely love it. I cannot wait to hang it on the wall in our prayer corner. I think you need one for your family too. After all All Saints day is fast approaching. Gina has also arranged that the first 10 orders receive free shipping, no code needed. Head on over to her etsy shop won’t you. Very pretty, but hopefully paying orders won't have the family's name spelt wrong like yours. LOL! You were the first to notice it! It has since been corrected. No worries. Thank you for the update! It really is very pretty, and there are many great prints in her shop! Were I Christian, I'd definitely buy some of her digital products!